Pumps pvc suede with crystals, pearls and hand-made applications painted. 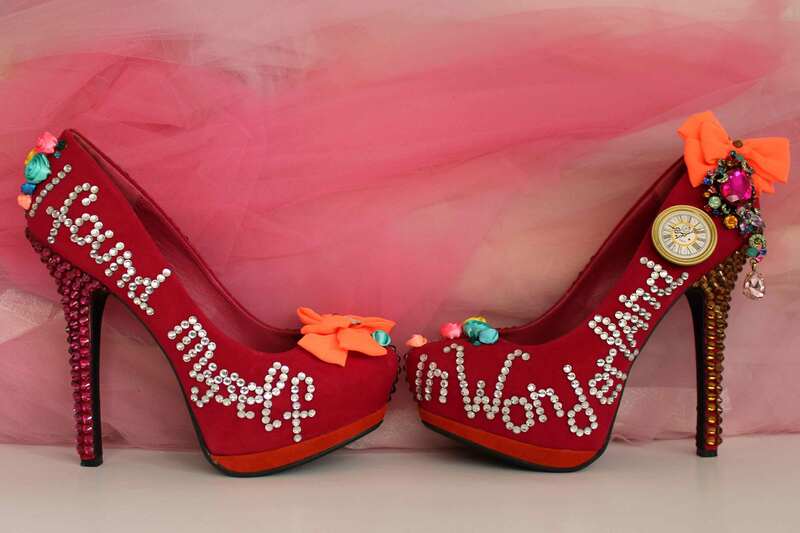 Alice in Wonderland Collection. This is a luxury One-of-a kind product embroidered hand-made. The pair has asymmetric embroideries on each shoe. Available size 8.5. Shipping cost included 5-10 business days worldwide. Pumps pvc suede with crystals, pearls applications in pink color. Halloween Collection. This is a luxury One-of-a kind product embroidered hand-made. The pair has asymmetric embroideries on each shoe. Available size 7. Shipping cost included 5-10 business days worldwide. Black color pumps pvc suede with glitters high heels. Crystals, pearls applications and feathers. This is a luxury One-of-a kind product embroidered hand-made. The pair has asymmetric embroideries on each shoe. Available size 5.5 and 7.5. Shipping cost included 5-10 business days worldwide. Pink color pumps pvc suede with crystals, pearls applications.This is a luxury One-of-a kind product embroidered hand-made. The pair has asymmetric embroideries on each shoe. Available size 8.5. Shipping cost included 5-10 business days worldwide. Turquoise color pumps pvc suede with crystals, pearls applications, sequins bow. This is a luxury One-of-a kind product embroidered hand-made. The pair has asymmetric embroideries on each shoe. Available size 6.5. Shipping cost included 5-10 business days worldwide.